Halle (Saale) is a city in the southern part of theGerman state Saxony-Anhalt. Halle is an economic and educational center in central-eastern Germany. The University of Halle-Wittenberg is the largest university in Saxony-Anhalt and one of the oldest universities in Germany, and a nurtiring ground for the local startup ecosystem. Together with Leipzig, Halle is at the heart of the Central German Metropolitan Region. Halle (Saale) is situated in the southern part of Saxony-Anhalt, along the river Saale which drains the surrounding plains and the greater part of the neighbouring Free State of Thuringia located just to its south, and the Thuringian basin, northwards from the Thuringian Forest. Leipzig, one of the other major cities of eastern Germany, is only 35 kilometres (22 mi) away. Halle’s early history is connected with harvesting of salt. The name Halle reflects early Celtic settlement given that ‘halen’ is the Brythonic (Welsh/Breton) word for salt (cf. ‘salann’ in Irish). The name of the river Saale also contains the Germanic root for salt, and salt-harvesting has taken place in Halle at least since the Bronze Age (2300-600 BC). The town was first mentioned in AD 806. It became a part of the Archbishopric of Magdeburg in the 10th century and remained so until 1680, when Brandenburg-Prussiaannexed it together with Magdeburg as the Duchy of Magdeburg, while it was also an important location for Martin Luther’s Reformation with Albert of Mainz as his ecclesiastic counterpart. According to historic documents, the city of Halle has been a member of the Hanseatic League at least since 1281. The Battle of Halle was fought between French and Prussian forces on 17 October 1806. The fighting moved from the covered bridges on the west side of the city, through the streets and market place, to the eastern suburbs. In 1815 Halle became part of the Prussian Province of Saxony. During World War II, KZ-Außenlager Birkhahn, a subcamp of Buchenwald was located in Halle, where prisoners from Poland, Czechoslovakia, the Soviet Union, France, Netherlands and other nations were forced to work in the Siebel aircraft plants, making combat aircraft. The plant was later dismantled. In Ammendorf, a large factory owned byOrgacid (de) produced mustard gas. Near the end of World War II, there were two bombing raids carried out against the town: the first on 31 March 1945, the second a few days later. The first attack took place between the railway station and the centre of the city and the second bombing was in the southern district. It killed over 1,000 inhabitants; 3,600 buildings were destroyed and many heavily damaged. Among them, the Market Church, St. George Church, the Old Town Hall, the City Theatre, historic buildings on Bruederstrasse and on Grosse Steinstrasse, and the city cemetery. On 17 April 1945, Halle was occupied by American troops, and the red tower was set on fire by artillery and destroyed. Also, the Market Church and the Church of St. George received more hits. However, the city did not sustain further damage because a planned aerial bombardment was canceled, after the former naval officer Felix von Luckner negotiated the surrender of the city to the American army. In July, the Americans withdrew and the city was occupied by the Red Army. 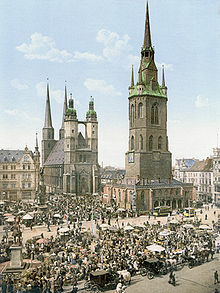 After World War II, Halle served as the capital of the short-lived administrative region of Saxony-Anhalt, this was until 1952 when the East German government abolished its “Länder” (states). As a part of East Germany (until 1990), it functioned as the capital of the administrative district (“Bezirk”) of Halle. Halloren Chocolate Factory and visitors’ centre, the oldest chocolate factory in Germany. 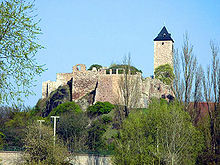 Giebichenstein Castle, first mentioned in 961, in the north of the city centre on a hill above the Saale river, with a museum in the upper castle and the Burg Giebichenstein University of Art and Design in the lower castle. Moritzburg, a newer castle, was built between 1484 and 1503. It was the residence of the Archbishops of Magdeburg, was destroyed in the Thirty Years’ War, and was a ruin afterwards for centuries. Partially reconstructed in 1901-1913, it is an art gallery today. The reconstruction was completed with the opening of new exhibition rooms, designed by the Spanish architects Sobejano and Nieto, in 2010. Market Church of St. Mary (Marktkirche), built in 1529–1554, using elements of two medieval churches, St. Gertrude’s Church dating back to the 11th century and the older St. Mary’s Church from the 12th century. The church has four steeples, the two western octagonal ones are called Blue Towers because of their dark blue slate roofing. The other two Hausmannstürme are connected by a bridge and on this bridge was the city’s fire watch. The church owns the original death-mask of Martin Luther. The Marktkirche’s four towers is a landmark symbol of the city. Ratshof (Council’s Yard), built in 1928/29 as a backyard building of the Old Town Hall (demolished in 1948/50 after the destruction of WWII, so the Ratshof is situated today directly on the market square). Saint Maurice Church, late Gothic building (1388–1511), it has been the church of the Reformed parish. Reichardts Garten is an historic park, part of the Garden Dreams project. Laid out in 1794 by Johann Friedrich Reichardt (1752–1814) as an English garden, becoming the “accommodation of Romanticism”. It changed ownership several times and the city of Halle bought the park in 1903 to give the wider public access. Baroque composer Georg Friedrich Händel (later George Frideric Handel) was born in Halle in 1685 and spent the first 17 years of his life in the city. The house where he lived is now a museum about his life. To celebrate his music, Halle has staged a Handel Festival since 1922, annually in June since 1952. The Franckesche Stiftungen (Francke Foundations) are home to the Stadtsingechor zu Halle (de), which was founded before the year 1116 and is one of the oldest boys’ choirs in the world. The University of Halle was founded here in 1694. It is now combined with the University of Wittenberg and called the Martin Luther University of Halle-Wittenberg. The university’s medical school was established by Friedrich Hoffmann. Its botanical garden, theBotanische Garten der Martin-Luther-Universität Halle-Wittenberg, dates back to 1698. Halle’s German Academy of Sciences Leopoldinais the oldest and one of the most respected scientific societies in Germany. Halle is also home to Germany’s oldest Evangelical Bible college, known as the Marienbibliothek (de), with 27,000 titles. The seat of the Max Planck Institute for Social Anthropology, one of the world’s largest social anthropological research institutions and a part of the Max Planck Society, is in Halle. In the past Halle was a centre of German Pietism and played an important role in establishing the Lutheran church in North America, whenHenry Muhlenberg and others were sent as missionaries to Pennsylvania in the mid-18th century. Muhlenberg is now called the first Patriarch of the Lutheran Church in America. He and his son, Frederick Muhlenberg, who was the first Speaker of the United States House of Representatives, were graduates of Halle University. Halle’s prominence as a railway centre is set to continue growing with the arrival of the Erfurt-Leipzig/Halle high-speed railway.Leipzig will also be connected to this railway, but since it is a terminus station (though the Leipzig City Tunnel is currently under construction, the route will be shared with S-Bahn trains, making it unlikely that it will be used as a through station for Berlin-Munich trains), Halle is more likely to be used as an intermediate stop for Berlin-Munich trains. The completion of the Nuremberg–Erfurt high-speed railway will also provide a further impetus to use the route. The football team Hallescher FC Wacker 1900 had some regional importance before World War II. In the German Championship Wacker reached the semi-finals in 1921, and the quarter-finals in 1928. The successor team became East German champions in 1949 and 1952 under the names of ZSG Union and BSG Turbine Halle. From these evolved today’s Turbine Halle and Hallescher FC. In the era of the German Democratic Republic, the latter club (as Chemie Halle ) was a mainstay in the first division and won the Cup tournament in 1956 and 1962. The most prominent player was 72-times international Bernd Bransch, who was with Chemie in the 1960s and 1970s. These days, Hallescher FCusually plays in the third division. The general sports club SV Halle (de), originating from Chemie Halle, created a notable number of Olympic gold medallists and world champions, mainly in nautical and watersports, e.g., swimmer Kornelia Ender won four Olympic gold medals in 1976 and Andreas Hajek won four rowing world championships between 1998 and 2001. The basketball team of the club – these days known as Lions and focusing on the woman’s team which plays in the national first division – won five men’s and 10 women’s championships of the German Democratic Republic. The Hallesher FC’s location is extremely close to a tram station.